Surrey, B.C. 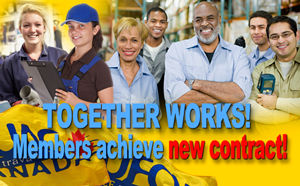 – December 11, 2015 – UFCW Local 247 members working at Versacold Third Party Logistics in Surrey, British Columbia have recently ratified a new collective agreement. Versacold specializes in the warehousing and logistics of temperature sensitive products. The Surrey distribution centre features three different zones, each with unique temperatures. The new five-year agreement is retroactive to January 2015 and covers the 220 members working at the Surrey warehouse. Workers will see an increase of $1.85 per hour over the duration of the contract. In addition, members will receive increases to the safety boot allowance as well as improvements to contract language regarding statutory days off. The new contract also introduces the ability for workers to receive five-week's paid vacation as well as improvements to overtime language. This is the second contract for members at Versacold in Surrey, having joined UFCW Canada Local 247 in 2009.